‘Fit as fiddles and as hard as nails’ – the phrase comes from diarist Stanley Beresford Mundey’s description of the effect on soldiers of a regime of hard work and scant food. Whatever was the original author’s meaning, to the modern ear this unsettling phrase – hard as nails – chimes with what we now know to have been the experience of those individuals who lived beyond the trauma of the Great War; even those who apparently survived intact must have been changed profoundly by it. 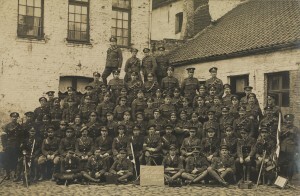 Charles Wynne (1896-1917) of Avoca, Co Wicklow; front row, 3rd from left (rom TCD MS 10247). In these centenary years a national discourse has opened on the service of Irish people in the British Army and the recognition of the role played in the formation of modern Irish society of members of more than one historical tradition. It is with this in mind that the Library presents, as a major online resource, photographs and transcriptions of the diaries and letters of some Irish men and women who served or observed during the years 1914-1918. 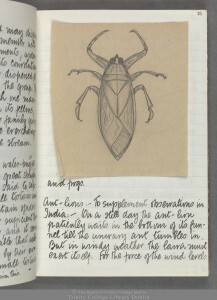 Sketch from Richard Hingston’s diary. TCD MS 10516 folio 73r. The intention in designing this project was to keep the end product as simple as possible, while wishing it to be reliable, functional and aesthetically pleasing. It was decided to adopt a less-is-more approach, keeping editorial interventions to a minimum. The assumption was made that users of this resource have access to other sources to inform them about the War generally, thus negating the need for multiple dynamic links. Incorrect spellings have been changed only if clarity would otherwise be compromised; abbreviations are usually left as they appear in the originals; decisions had to be made regarding punctuation where individuals wavered between full-stops and hyphens at the end of sentences, or neglected to close quotations, or use possessive apostrophes. These decisions have been silently implemented. Certain abbreviations such as ‘st/th’ or ‘a.m.’ or the use of superscript have been made consistent throughout. Where an author crossed out a word and substituted another, the first word has not been provided (and inserted text is placed in angled brackets). An example of the danger of this approach may be seen in the instances of self-censorship practiced by Howard-Bury when he re-worked his diary. On one occasion he referred to men spending time with ‘ladies of easy virtue’ (MS 10823 folio 20 recto) which he then changed to ‘Germans’; another reference to getting drunk was subsequently changed to ‘dissipation’; another alteration changed a reference to ‘stinking’ wounds’ to the slightly less appalling ‘neglected wounds’. Sketch of his room as a Turkish prisoner of war by Stanley Beresford Mundey. TCD MS 3420a. When Stanley Beresford Mundey re-worked his diary into a memoir he wrote only on the recto or right hand page, leaving the left hand page blank for revisions or additions. When this happened, although the page containing material to be inserted has been photographed, the text has been transcribed in the position the author intended it to be. There are two diaries which exist in transcription only; the originals are in private hands which means that difficult readings cannot be checked. 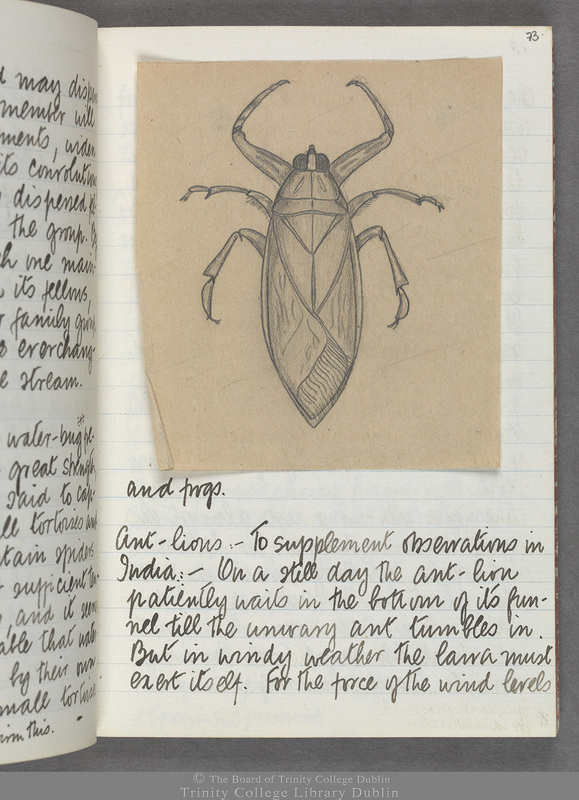 Only certain items from the material in the Library’s collections have been selected for inclusion in this work. The feasibility of a second phase will be assessed in due course. The project was planned and managed by Jane Maxwell. Of those who were involved particular acknowledgement must be made to Aisling Lockhart. The burden of work was shouldered by other colleagues in the Manuscripts & Archives Research Library; Claire Allen, Estelle Gittins, Linda Montgomery, Caoimhe Ní Ghormáin, Martine O’Byrne, Ellen O’Flaherty, and Felicity O’Mahony. 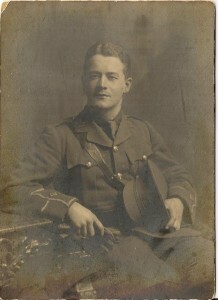 Arthur Callaghan, one of three TCD brothers to serve. The imaging was done by Gill Whelan in the Digital Resources Imaging Service and the technical advice and support was provided by Greg Sheaf. Part of the project involved the devising of a voluntary ‘internship’ undertaken by assistant librarian Ella Hassett. Initial consultative services provided by Jane Burns Associates and the financial support received from the Trinity Association & Trust is gratefully recognised. 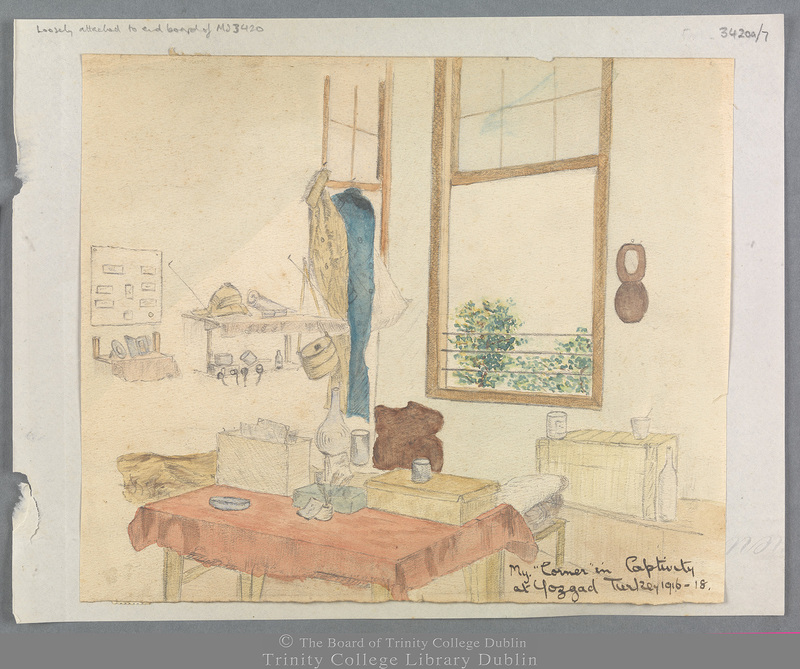 The blog is hosted by the Research IT unit in Trinity College Dublin – their help in keeping the website up and running has been invaluable. Paddy Doyle deserves special thanks for going above and beyond the call of duty on many occasions. Finally we are very grateful for the support of the families of the original authors. Charles Howard-Bury (standing second from left) on the first Everest reconnaissance expedition 1921.